PERFECT GUACAMOLE | YUM YUM PIGGY'S BUM...! My best experience of tasting guacamole happened in San Diego during a work conference. We don’t really have much a great Mexican food influence here in the UK but over in San Diego, there was plenty of opportunity to eat Mexican food as San Diego is pretty close to Mexico with many Mexicans living there. WOW WOW WOW! Gorgeous creamy guacamole bursting with zesty flavours with a chilli kick, perfect for snacking on with tortilla chips. What can I say? San Diego made me a massive fan of Mexican food but returning back to England, I was sorely disappointed with the lack of good Mexican food. A trip to the Mexican restaurant chain Chiquitas did nothing to console my wanton lust for some tasty Mexican tucker. Have attempted the guacamole in the chilled section of the supermarkets but not impressed by the heavy creaminess and lack of zesty zingy freshness. Decided it was time to prepare it myself and have come with my own version which is simple and quick to prepare. The main thing I noticed was that there is no exclusive recipe for guacamole, you can make it as you wish! The important ingredients include ripe avocados, you can tell by pressing down on the skin, if it gives slightly and feels soft, it’s ripe. The Haas avocado variety with the knobbly brown skin is one I prefer as it has a creamy texture. Coriander and either lemon or lime for tanginess is a must. I like tomato and spring onion in mine as it gives it extra flavour, some people prefer white onion and garlic in theirs but I find the flavour too overpowering. Texture is also important, try not to blend the avocados to a smooth puree, much more satisfying to have some chunky bits in there. If you want to store the guacamole in the fridge, cover it with clingfilm to prevent it being oxidised and turing to an unattractive brown colour. 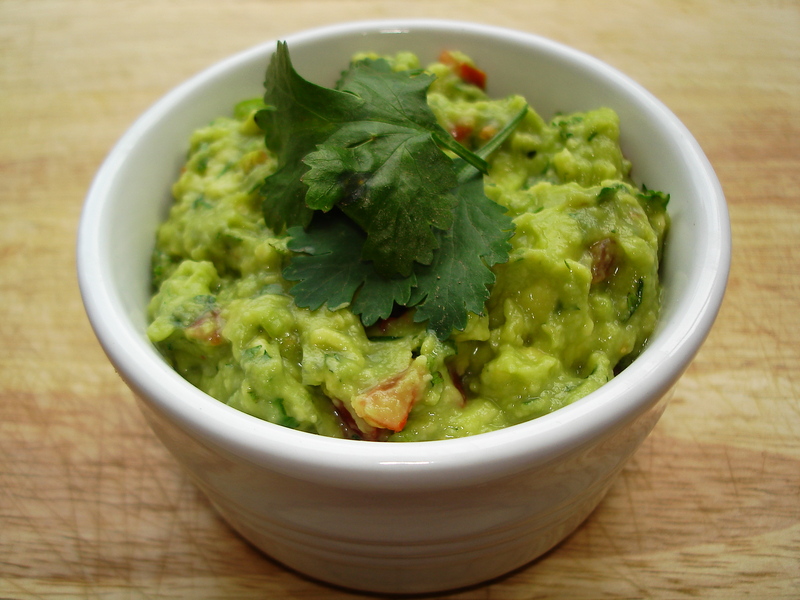 Guacamole is great as a dip for snacking on with tortilla chips and strips of toasted pitta bread. I would consider this a healthy snack as avocados are high in monounsaturated fat, great for reducing heart disease, it’s what accompanies it that could make it unhealthy! Cut each avocado in half lengthways and take the stones out. Scoop out the flesh into a bowl. Add the salt to the avocados and mash gently with a fork ensuring that the texture has some chunks in there. 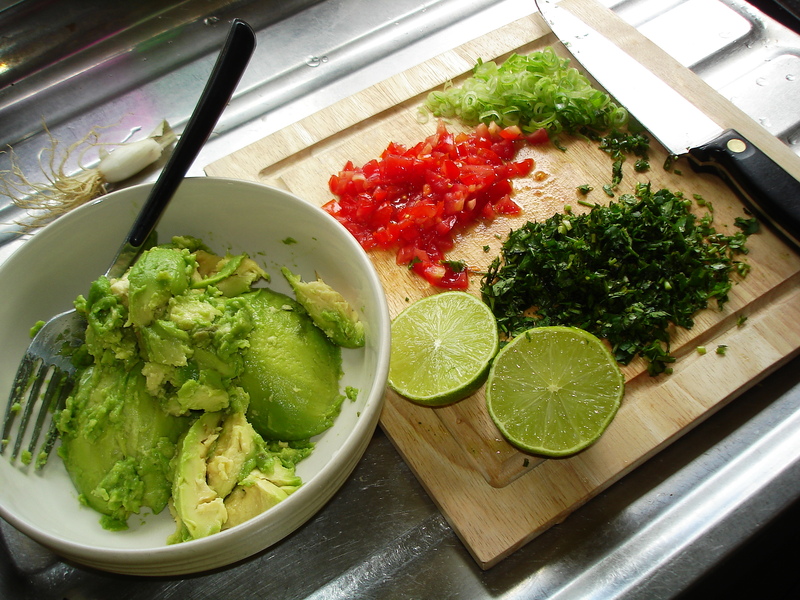 Add the chillis, spring onions, tomato, coriander and juice of 1 lime to the avocados and gently mix with a fork. Serve straightway with your favourite tortilla chips!